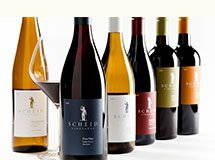 Al Scheid first purchased property in Monterey County in 1972, a 10-acre parcel located on the edge of the town of Greenfield. Monterey wine grape growing was in its infancy and Al was drawn to the region for its untapped potential. He consulted with Professor A.J. Winkler, a viticultural authority at the University of California at Davis, who had published a report in 1960 classifying grape growing regions by climate. Monterey County was classified as Regions I and II, comparable to Napa, Sonoma, Burgundy and Bordeaux, making it one of the most climatically suitable regions in the state for growing high quality wine grapes. The first 10 acres were quickly followed by other unplanted parcels located near Greenfield – land that turned into our present day Elm, Hacienda, Viento and Baja Viento Vineyards. 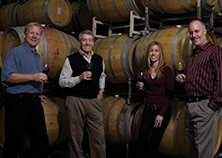 In 1974, we secured another potential-filled parcel of open land which became known as the Scheid Vineyard. In 1979, a swath of beautiful, rolling land 22 miles south of Greenfield became available which became our San Lucas Vineyard, along with an ultra-premium Cabernet site named Kurt’s Vineyard. 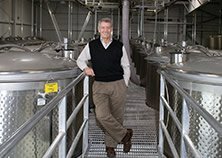 In 1997, we acquired our Riverview Vineyard in Soledad, followed by the development of our Hames Valley Vineyard in the southernmost reaches of Monterey County. Mesa del Rio Vineyard in Greenfield was developed in 1999, rounding out our portfolio of eleven estate vineyards located along a 70-mile stretch, north-to-south, all in Monterey County. The unique geography of Monterey County, which results in a range of micro-climates, and the diversity of our estate vineyards allow us to grow many different varieties in a spectrum of styles. Our mantra for 47 years, borrowed from writer, artist and philosopher John Ruskin, is that “quality is never an accident; it is always the result of intelligent effort”. It’s an ideal we don’t take lightly. Quality is a term that has been trivialized, used by purveyors from McDonald’s to Verizon to Kmart. Genuine quality is harder to come by and does not mean simply well-made or acceptable. Real quality is that which is superior. It is the result of thought, analysis, communication, sweat and the utmost care, succinctly stated by Mr. Ruskin as “intelligent effort”. True quality is only achieved through mindful action each step of the way, from every vineyard practice performed, to the crucial timing of the harvest, through each stage in the winery. It is never an accident.